Badas, Alex and Stauffer, Katelyn E. 2019. Michelle Obama as a Political Symbol: Race, Gender, and Public Opinion toward the First Lady. Politics & Gender, p. 1. Kittilson, Miki Caul 2019. The Palgrave Handbook of Women’s Political Rights. p. 21. Barnes, Tiffany D. and Taylor-Robinson, Michelle M. 2018. Measuring Women’s Political Empowerment across the Globe. p. 229. Badas, Alex and Stauffer, Katelyn E. 2018. Someone like Me: Descriptive Representation and Support for Supreme Court Nominees. Political Research Quarterly, Vol. 71, Issue. 1, p. 127. Wolbrecht, Christina and Campbell, David E. 2017. Role models revisited: youth, novelty, and the impact of female candidates. Politics, Groups, and Identities, Vol. 5, Issue. 3, p. 418. Carreras, Miguel 2017. High-Profile Female Executive Candidates and the Political Engagement of Women. Political Research Quarterly, Vol. 70, Issue. 1, p. 172. Tam, Waikeung 2017. Women Representing Women? Evidence from Hong Kong’s Semi-Democratic Legislature. Representation, Vol. 53, Issue. 3-4, p. 201. Abramson, Paul R., and Inglehart, Ronald. 1995. Value Change in Global Perspective. Ann Arbor: University of Michigan Press. Annesley, Claire, Beckwith, Karen, Engeli, Isabelle, and Franceschet, Susan. 2012. “Theoretical Perspectives on Gender and Executive Leadership.” Presented at the Midwest Political Science Association, Chicago. Annesley, Claire, and Gains, Francesca. 2010. “The Core Executive: Gender, Power and Change. Political Studies 58 (5): 909–29. Atkeson, Lonna Rae. 2003. “Not All Cues Are Created Equal: The Conditional Impact of Female Candidate on Political Engagement.” Journal of Politics 65 (4): 1040–61. Atkeson, Lonna Rae, and Carrillo, Nancy. 2007. “More Is Better: The Influence of Collective Female Descriptive Representation on External Efficacy.” Politics & Gender 3 (1): 79–101. Banaszak, Lee Ann. 2010. The Women's Movement Inside and Outside the State. Cambridge: Cambridge University Press. Barnes, Tiffany D., and Burchard, Stephanie M.. 2012. “‘Engendering’ Politics: The Impact of Descriptive Representation on Women's Political Engagement in Sub-Saharan Africa.” Comparative Political Studies 46 (7): 767–90. Bogdanor, Vernon. 1992. Proportional Representation: Which System? London: Election Reform Society of Great Britain and Ireland. Borrelli, MaryAnne. 2002. The President's Cabinet: Gender, Power, and Representation. Boulder, CO: Lynn Rienner. Bratton, Kathleen A., and Ray, Leonard P.. 2002. “Descriptive Representation, Policy Outcomes, and Municipal Day-Care Coverage in Norway.” American Journal of Political Science 46 (2): 428–37. Campbell, David E., and Wolbrecht, Christina. 2006. “See Jane Run: Women Politicians as Role Models for Adolescents.” Journal of Politics 68 (2): 233–47. Carroll, Susan J. 1994. Women as Candidates in American Politics. Bloomington: Indiana University Press. Caul, Miki. 2001. “Political Parties and the Adoption of Candidate Gender Quotas: A Cross-National Analysis.” Journal of Politics 63 (4): 1214–29. Celis, Karen, Childs, Sarah, Kantola, Johanna, and Krook, Mona Lena. 2008. “Rethinking Women's Substantive Representation.” Representation 44 (2): 99–110. Childs, Sarah, and Krook, Mona Lena. 2008. “Critical Mass Theory and Women's Political Representation.” Political Studies 56 (3): 725–36. Dalton, Russell J. 2008. Citizen Politics: Public Opinion and Political Parties in Advanced Industrial Democracies. Thousand Oaks, CA: Sage. Davis, Rebecca Howard. 1997. Women and Power in Parliamentary Democracies: Cabinet Appointments in Western Europe, 1968–1992. Vol. 2. Lincoln: University of Nebraska Press. Dahl, Viktor, and Stattin, Håkan. 2014. “Beyond the Limits: Involvement in Illegal Political Activities.” European Political Science Review 8 (1): 125–45. Desposato, Scott, and Norrander, Barbara. 2009. “The Gender Gap in Latin America: Contextual and Individual Influences on Gender and Political Participation.” British Journal of Political Science 39 (1): 141–62. Dovi, Suzanne. 2014. “Political Representation.” In The Stanford Encyclopedia of Philosophy, ed. Zalta, Edward N.. http://plato.stanford.edu/archives/spr2014/entries/political-representation/ (accessed June 26, 2016). Earl, Jennifer, and Kimport, Katrina. 2009. “Movement Societies and Digital Protest: Fan Activism and other Nonpolitical Protest Online.” Sociological Theory 27 (3): 220–43. Earl, Jennifer, Kimport, Katrina, Prieto, Greg, Rush, Carly, and Reynoso, Kimberly. 2010. “Changing the World One Webpage at a Time: Conceptualizing and Explaining Internet Activism.” Mobilization: An International Quarterly 15 (4): 425–46. Escobar-Lemmon, Maria, and Taylor-Robinson, Michelle M.. 2005. “Women Ministers in Latin American Government: When, Where, and Why?” American Journal of Political Science 49 (4): 829–44. Ewig, Christina. 2008. “Reproduction, Re-Reform and the Reconfigured State: Feminists and Neo-Liberal Health Reforms in Chile.” In Beyond States and Markets: The Challenges of Social Reproduction, eds. Bakker, Isabella and Silvey, Rachel. New York: Routledge, 143–58. Fox, Richard L., and Lawless, Jennifer L.. 2004. “Entering the Arena? Gender and the Decision to Run for Office.” American Journal of Political Science 48 (2): 264–80. Fox, Richard L., and Lawless, Jennifer L.. 2010. “If Only They'd Ask: Gender, Recruitment, and Political Ambition.” Journal of Politics 72 (2): 310–26. Franceschet, S. 2010. “Continuity or Change? Gender Policy in the Bachelet Administration.” In The Bachelet Government: Conflict and Consensus in Post-Pinochet Chile, eds. Borzutzky, Silvia and Weeks, Gregory B.. Gainesville: University Press of Florida, 158–80. Gallagher, Michael, and Mitchell, Paul, eds. 2005. The Politics of Electoral Systems. Oxford: Oxford University Press. Golder, Matthew. 2005. “Electoral System Type.” In The Quality of Government Dataset Codebook, QOG Institute Quality of Government, University of Gothenburg. http://www.qog.pol.gu.se/digitalAssets/1358/1358062_qog_codebook_v6apr11.pdf (accessed April 7, 2014). Inglehart, Ronald. 1997. Modernization and Postmodernization: Cultural, Economic and Political Change in 43 Societies. Princeton, NJ: Princeton University Press. Inglehart, Ronald, and Norris, Pippa. 2003. Rising Tide: Gender Equality and Cultural Change around the World. Cambridge: Cambridge University Press. Inter-Parliamentary Union (IPU). 2009. “Women in National Parliaments.” http://ipu.org/wmn-e/world.htm (accessed January 14, 2014). Inter-Parliamentary Union (IPU). 2015. “Women in National Parliaments.” http://ipu.org/wmn-e/world.htm (accessed September 27, 2015). Kahne, Joseph, Middaugh, Ellen, and Allen, Danielle. 2014. “Youth, New Media, and the Rise of Participatory Politics.” In From Voice to Influence: Understanding Citizenship in a Digital Age, eds. Allen, Danielle and Light, Jennifer S.. Chicago: University of Chicago Press, 35–58. Karp, Jeffrey A., and Banducci, Susan A.. 2008. “Political Efficacy and Participation in Twenty-Seven Democracies: How Electoral Systems Shape Political Behaviour.” British Journal of Political Science 38 (2): 311–34. Kathlene, Lyn. 2001. 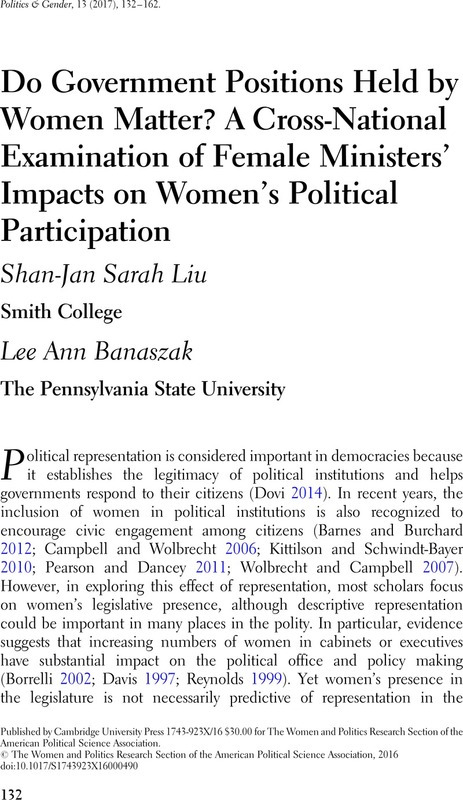 “Words That Matter: Women's Voice and Institutional Bias in Public Policy Formation.” In The Impact of Women in Public Office, ed. Carroll, Susan J.. Bloomington: Indiana University Press, 22–48. Kittilson, Miki Caul, 2005. “In Support of Gender Quotas: Setting New Standards, Bringing Visible Gains.” Politics & Gender 1 (4): 638–45. Kittilson, Miki Caul. 2006. Challenging Parties, Changing Parliaments: Women and Elected Office in Contemporary Western Europe. Columbus: Ohio State University Press. Kittilson, Miki Caul. 2008. “Representing Women: The Adoption of Family Leave in Comparative Perspective.” Journal of Politics 70 (2): 323–34. Kittilson, Miki Caul, and Schwindt-Bayer, Leslie. 2010. “Engaging Citizens: The Role of Power-Sharing Institutions. Journal of Politics 72 (4): 990–1002. Krook, Mona Lena, and O'Brien, Diana Z.. 2012. “All the President's Men? The Appointment of Female Cabinet Ministers Worldwide.” Journal of Politics 74 (3): 840–55. Lawless, Jennifer L., and Fox., Richard L. 2005. It Takes a Candidate: Why Women Don't Run for Office. Cambridge: Cambridge University Press. Lawless, Jennifer L., and Fox., Richard L.. 2015. Running from Office: Why Young Americans are Turned Off to Politics. Oxford: Oxford University Press. Lijphart, Arend. 2012. Patterns of Democracy: Government Forms and Performance in Thirty-Six Countries. New Haven, CT: Yale University Press. Lister, Ruth. 2003. Citizenship: Feminist Perspectives. 2nd ed. New York: New York University Press. Maguth, Brad M. 2012. “Investigating Student Use of Technology for Engaged Citizenship in a Global Age.” Education Sciences 2 (2): 57–76. Matland, Richard E., and Studlar, Donley T.. 1996. “The Contagion of Women Candidates in Single-Member District and Proportional Representation Electoral Systems: Canada and Norway.” Journal of Politics 58 (3): 707–33. Marx, David M., and Roman, Jasmin S.. 2002. “Female Role Models: Protecting Women's Math Test Performance.” Personality and Social Psychology Bulletin 28 (9): 1183–93. McAdam, Douglas. 1986. Recruitment to High-Risk Activism: The Case of Freedom Summer. American Journal of Sociology 92 (1): 64–90. McAdam, Douglas. 1992. “Gender as a Mediator of the Activist Experience: The Case of Freedom Summer.” American Journal of Sociology 97 (5): 1211–40. McDonagh, Elaine. 2009. The Motherless State: Women's Political Leadership and American Democracy. Chicago: University of Chicago Press. McGlenn, Nancy, and Sarkees, Meredith Reid. 1997. “Style Does Matter: The Impact of Presidential Leadership on Women in Foreign Policy. In The Other Elites: Women, Politics, and Power in the Executive Branch, eds. Borrelli, MaryAnne and Martin, Janet. Boulder, CO: Lynne Rienner, 107–28. Moore, Gwen, and Shackman, Gene. 1996. “Gender and Authority: A Cross-National Study.” Social Science Quarterly 77 (2): 273–88. Norris, Pippa, and Krook, Mona Lena. 2009. “One of Us: Multilevel Models Examining the Impact of Descriptive Representation on Civic Engagement. Presented at the Annual Meeting of the American Political Science Association, Toronto. Nixon, Lucia A., and Robinson, Michael D.. 1999. “The Educational Attainment of Young Women: Role Model Effects of Female High School Faculty.” Demography 36 (2): 185–94. Norris, Pippa, and Lovenduski, Joni. 1993. “‘If Only More Candidates Came Forward’: Supply-Side Explanations of Candidate Selection in Britain.” British Journal of Political Science 23 (3): 373–408. Paxton, Pamela. 1997. “Women in National Legislatures: A Cross-National Analysis.” Social Science Research 26 (4): 442–64. Paxton, Pamela, and Kunovich, Sheri. 2003. “Women's Political Representation: The Importance of Ideology.” Social Forces 82 (1): 87–113. Pearson, Kathryn, and Dancey, Logan. 2011. “Elevating Women's Voices in Congress Speech Participation in the House of Representatives.” Political Research Quarterly 64 (4): 910–23. Raudenbush, Stephen W., and Bryk, Anthony S.. 2002. Hierarchical Linear Models: Applications and Data Analysis Methods. Vol. 1. Thousand Oaks, CA: Sage. Reynolds, Andrew. 1999. “Women in the Legislatures and Executives of the World.” World Politics 51 (4): 547–73. Schlozman, Kay Lehman, Burns, Nancy, and Verba, Sidney. 1999. “What Happened at Work Today? A Multistage Model of Gender, Employment, and Political Participation.” Journal of Politics 61 (1): 29–53. Schwindt-Bayer, Leslie A. 2010. Political Power and Women's Representation in Latin America. Oxford: Oxford University Press. Schwindt-Bayer, Leslie A., and Mishler, William. 2005. “An Integrated Model of Women's Representation.” Journal of Politics 67 (2): 407–28. Steckenrider, Janie S. 2013. “Angela Merkel: From Serendipity to Global Success.” In Women as Political Leaders: Studies in Gender and Governing, eds. Genovese, Michael A. and Steckenrider, Janie S.. New York: Routledge, 226–55. Verba, Sidney, Burns, Nancy, and Schlozman, Kay Lehman. 1997. “Knowing and Caring about Politics: Gender and Political Engagement.” Journal of Politics 59 (4): 1051–72. Verba, Sidney, Nie, Norman H., and Kim, Jae-on. 1978. Participation and Political Equality: A Seven-Nation Comparison. Chicago: University of Chicago Press. Warwick, Paul V., and Druckman, James N.. 2006. “The Portfolio Allocation Paradox.” European Journal of Political Research 45 (4): 635–80. Welch, Susan. 1977. “Women as Political Animals? A Test of Some Explanations for Male-Female Political Participation Differences.” American Journal of Political Science 21 (4): 711–30. Wiliarty, Sarah Elise. 2008. “Angela Merkel's Path to Power: The Role of Internal Party Dynamics and Leadership.” German Politics 17 (1): 81–96. Wolbrecht, Christina, and Campbell, David E.. 2007. “Leading by Example: Female Members of Parliament as Political Role Models.” American Journal of Political Science 51 (4): 921–39. Wolfsfeld, Gadi, Opp, Karl-Dieter, Dietz, Henry A., and Green, Jerrold D.. 1994. “Dimensions of Political Action: A Cross-cultural Analysis.” Social Science Quarterly 75(1): 98–114. World Bank. 2009. “Labor Force Participation Rate, Female.” http://data.worldbank.org/indicator/SL.TLF.CACT.FE.ZS (accessed January 15, 2014). World Values Survey (WVS). 2014. “World Values Survey.” http://www.worldvaluesurvey.org (accessed June 6, 2015).